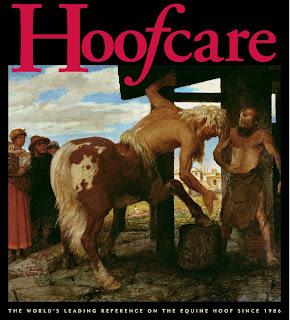 Fran Jurga`s Hoof Blog: News from Hoofcare + Lameness: Grass Laminitis: Something Else to Blame on Global Warming? Grass Laminitis: Something Else to Blame on Global Warming? I checked today, and the store on the corner still has rock salt, windshield fluid and ice scrapers on display when you walk in the door. But I'm sure it is getting to be spring somewhere. And I'm anticipating that the flower seeds, suntan lotion and seasickness remedies will be on the shelves here any day now--evidence that winter has finally passed. The only more sure sign of spring will be the first case of laminitis. But I can wait on that one. In an interesting press release, Spillers warned British horse and pony owners of the impact that climate change could have on horses and ponies prone to laminitis, and their theory is as valid on this side of the still-icy Atlantic as it is in Britain. "Winter" grass laminitis is a new way of looking at things, but it does make some sense...except around here, of course, the grass was very safely buried under many feet of snow most of the last four months! As if it's not bad enough already, in the coming years, laminitis really could be the single biggest risk to a horse’s health. The climate is changing and the seasons are beginning to merge into each other. Milder, wetter winters are countered by unpredictable summers that bring about flooding or droughts--and all this can have a severely detrimental effect on the way that grass grows and the "sugar" it contains. Horses and ponies are designed to eat a variety of grasses, plants and shrubs that are typically of low nutrient value and in particular are lower in soluble carbohydrate ("sugar"). But the pasture that we keep horses on today tends to be much richer. With our milder winters too, grass may be growing all year round now. Recent research worryingly suggests that the nutrient value of winter grass in Britain is now very similar to spring/summer grass in years past. Laminitis is now a real risk throughout the whole year. If you think a horse or pony could be prone to laminitis, it is sensible to provide or recommend a high-fiber, low-starch, low-sugar, low-calorie diet...and more exercise. Thanks to Spillers for sharing that cheerful news. Want to know (a lot) more about laminitis? Click here for a free download of the Australian Equine Laminitis Research Unit and Dr. Chris Pollitt's 34-page discourse What Causes Equine Laminitis? The role of impaired glucose uptake as provided by the Rural Industries Research and Development Corporation of the Australia government. Heaven (if that word is still permissible) forbid anyone should blame heavily fertilised pastures many now have, along with 'improved' feeds, plenty of xtra vitamins, horsie treats, corn oil to make them shed faster, and a myriad of other stuff, and a major lack of common sense in the general management/care of the kinds of horses and ponies that are susseptible to this malady. What caused this problem when the earth was going through a cooling phase? An equine in its own environment should gain weight during the lean months and then lose the weight during the winter months. Natives have the crest so that any extra reserves can be harmlessly store there, nowadays animals are going into the lean months with as much weight on them as they normally have going into the winter months. No wonder there is so much of theis damn thing going around!!!!! Again, proper and frequent trimming to keep the coffin bone stable in the hoof capsule is crucial in all horses but especially so in those prone to IR, Cushings, and other metabolic issues. Short trim cycles help too.....max 4 weeks in between. This usually helps them cope with anything mother nature throws at them.